Pushing the Envelope: Blitzstein's "Airborne"
I'm a sucker for aeronautics. Over winter break, I spent some time at both the National Air and Space Museum in Washington, D.C., and the Kennedy Space Center in Cape Canaveral, Florida. I looked up at the very X-1 that Chuck Yeager took across the sound barrier in 1947. I stood underneath a real Saturn V rocket — the same kind that propelled Neil Armstrong to the moon in 1969. And I thought about my favorite pilots, Joe and Brian Hackett. Yeager, Armstrong, and the Hackett brothers all pushed the outside of the envelope, taking their craft(s) to the limit and just a bit beyond. With his Airborne Symphony (1943-6), the American composer Marc Blitzstein (1905-64) seems to have done something similar to the symphonic envelope. The Airborne officially has three movements, but each movement is broken up into several discrete numbers — our first clue that this is as much a mini three-act-musical play as a symphony. (Howard Clurman used the apt adjective "Broadway" to describe this piece.2) The first movement covers humanity's long-held dreams of flying; the second reveals the dangers; and the third draws a middle ground (or airspace). The second movement jolts us to reality and to the German side during WWII, as a chorus shouts robotically and joylessly about the joys of supporting Hitler. This grotesque march may have gotten a laugh, but to me, it seems just terrifying enough not to be funny. But what follows is truly terrifying — a three-minute instrumental bombing of allied cities. (We know this because of the list of towns that follows, in the moving "Ballad of the Cities.") The theory of flight is now a full-fledged theory of fight. Things lighten up in the final movement, with the jocular "Ballad of Hurry-Up" and its catchy (though not as catchy as the Village People) refrain "In the Air Force." The song pokes fun at how missions apparently begin in a hurry and then get delayed or canceled as pilots wait to take off. That song would fit perfectly on Broadway, as would the "Ballad of the Bombardier" that follows. Here, a baritone, over a light wind accompaniment, tells of that nineteen-year-old soldier writing home to his Emily. As the soldier's voice takes over, the switch from winds to piano accompaniment brings us painfully but sweetly into the realm of the intimately personal. It's a rare moment of introspection in this rather outgoing symphony. A frantic "Chorus of the Rendezvous" returns us abruptly to the world of planes and guns and bombs. And the final number, about an "Open Sky," offers a new theory of flight that can never really come true. The chorus calls for the world to "Free the air for the Airborne," but the narrator cautions, "Not without warning!" Which really means not at all. Blitzstein chose his subject well — human beings love flying and they love war. All this symphony needs is a 21st-century update, or a sequel, to navigate it to the standard repertory. 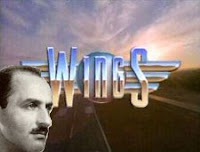 Meanwhile, I'll settle for Wings reruns on USA. 1. From Steve Ledbetter's liner notes to the BMG Classics release of the recording on CD, as Leonard Bernstein—The Early Years III, 5-6. 3. Blitzstein used this term because "nearly all his lines are couched in the imperative mood." From Leonard Lehrman, Marc Blitzstein: a Bio-Bibliography, 366. Sounds fascinating. I hope Naxos will issue this one in their American composers series. This one appearing on Naxos would be great. I'd love to hear a brand new recording of it, though I can understand it would be tough to put together. And of course I'm glad I got to hear the Emily song... very sweet. Emily, great point. I neglected to point out that Blitzstein said he wanted this to be "adaptable" for radio or film. I think this symphony would have been a great one for Frasier Crane to have done on Nightmare Inn for KACL. This is an incredible blog! I have wanted to do something similar myself, but have never gotten around to actually doing it. I am as delighted in knowing that symphonies that I know and hold in high regard are being presented in this way, as I am in being introduces to interesting sounding symphonies that I haven't heard yet. Fibich's delightful 1. Symphony (although it's 19th century), Symphonies by Arnold Bax, Ned Rorem, Gavriil Popov (1st Symphony), Jón Leifs (Saga Symphony) and Arthur Bliss (A Colour Symphony). I am not very familiar with the symphonies of Charles Tournemire and Mathijs Vermeulen, but I would be delighted to listen to any insight you may have regarding them. Also it might be interesting to pay attention to what perhaps is a beginning revival/discovery of the music by Danish composer Paul von Klenau (including 9 symphonies). Klenau is at least interesting for succeding in having several twelve-tone-operas performed in Germany during the Nazi regime. Thanks! Those are all great suggestions. Glad you're enjoying the blog! This is a great post, Matt. However, given Blitzstein's penchant for protest, I'm a bit surprised that he didn't use an "agit-prop"eller. Joking aside, is this a political piece? For example, might we read the casting of a black voice in the "Ballad of History and Mythology" as a critical comment on, as you've pointed out, the rather non-diversified history of flight? Are there other moments like it that you've encountered? rrb: first, nice one on the agit-propeller. Blitzstein would be proud. As for the possibility that the casting was a political comment, there don't seem to be other moments like that, so I doubt it. Seems like it was just a way for Blitzstein to shake things up. My first impression of the whole symphony was that it was a jingoistic piece with the primary aim of telling an inspiring story about flight. But maybe there is something biting here. I'd be interested to know if others have interpreted it that way. Interesting, I stumbled across this when I was looking on Google for some information on the "Airborne". I have it on a five or six disc 78 album set. Now I have learned something. Note that I have not spun the records yet but when I do, it will be right into my 9600. Thank you for doing this. Bernstein's second go at the Airborne is the more successful performance. There is the New York Philharmonic in a prime phase of its collaboration with Bernstein for one thing; for another thing, the narration is by Orson Welles, who gets more shadings out of the material by far. I heard Part 3 of the Airborne Symphony last night on radio after I got home from work. It was on a weekly New York Philharmonic radio broadcast. They were playing an archived recording with Bernstein conducting and Orson Welles narrating. I initially found the piece weird, as it didn't feel like a serious orchestra piece; it felt more like a musical, fit for Broadway. But as I listened, I got into it more and was appreciating it by the time it ended; I was sorry that I had missed the first two parts. I can see why Bernstein championed the piece. It is very theatrical, and Bernstein's musical personality favored theater. His own three symphonies are all very much non-staged theater pieces. But I would agree that the limited topical nature of the work (despite the thoroughness of Blitzstein's handling of the subject) and its clearly dated nature doomed it for neglect. I am interested in hearing the whole piece the next time I get a chance. I am very impress to read this informative article. " should read, "This article can be quite impressive to me, My sister loves feathers. Now if I can certainly just do it together with you do it will assist me score some important points with her. The Ogress of War: Leifs' "Saga Symphony"